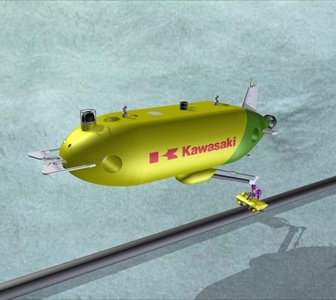 Kawasaki Heavy Industries, Ltd. today announced the launch in Aberdeen, Scotland, UK, of Kawasaki Subsea (UK) Limited, its new subsidiary specializing in the production, sale, and post-sale servicing of AUVs. With a focus on the growing demand for pipeline maintenance in offshore oil and gas fields, Kawasaki has been developing an AUV equipped with a robot arm for performing subsea pipeline inspections-the world’s first-based on a fusion of submarine technologies and industrial robot technologies fostered in-house over many years. Kawasaki plans to launch the AUV in fiscal 2020. Prior to that, the company intends to increase its market presence and construct a business network through the new company, which is strategically located in Aberdeen-a hub city for North Sea oil and gas businesses.